Just go and buy a coffee and slip the cup into your bag..
at five quid or whatever idiotic price they charge for a poncey cup of crap they should give you the cup anyway ! 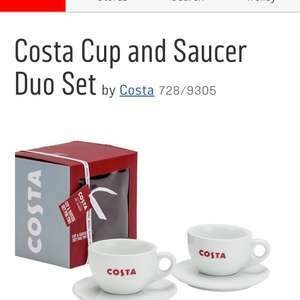 Don't think these are the full sized Costa mugs. These are CUPS! Thanks for that. I'll check tomorrow. The large mugs are 450ml. Where do you put the code for click and collet? Definitely not 340ml size. About 250ml if you're lucky. Might be OK for a black Americano, but way too small for a Latte. Definitely not 340ml size. About 250ml if you're lucky. Might be OK for …Definitely not 340ml size. About 250ml if you're lucky. Might be OK for a black Americano, but way too small for a Latte.